This week let's check out a prehistoric amphibian! Enter Beelzebufo ampinga! Beelzebufo was a large frog that lived in what is now Northern Madagascar, during the Late Cretaceous, about 70 million years ago. Specimens are fragmentary, but the largest individuals appear to have been between nine and ten inches long from snout to rump. 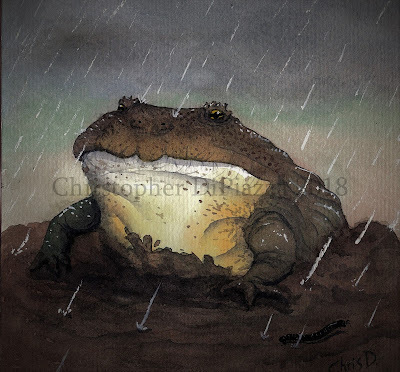 Like all amphibians, Beelzebufo would have been a meat-eater as an adult. (Assuming it started as a tadpole, which commonly will eat algae.) 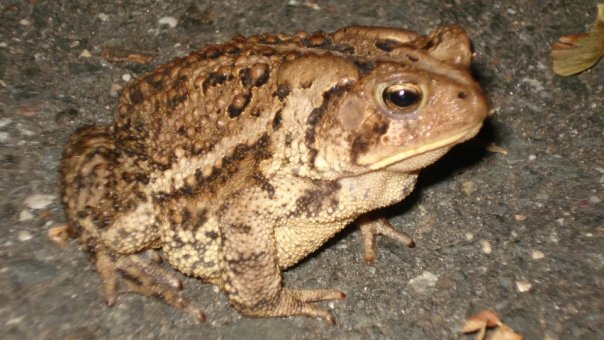 The genus name translates to "Beelzebub Toad", in reference to Beelzebub, the biblical demon and sometimes alternate name for Satan. The species name, ampinga, means "shield" in Malagasy, in reference to the frog's wide, broad skull. Beelzebufo emerging from hibernation during the first heavy rain of the year. Watercolor reconstruction by Christopher DiPiazza. When Beelzebufo was first published, very fragmentary remains were on the fossil record at the time. This mostly consisted of material from the skull, which was proportionally huge for any frog. That being said, early size estimates put Beelzebufo at sixteen inches long, making it by far the largest member of anura (Order that includes frogs and toads. Toads are actually within the frog group. So all toads are frogs but not all frogs are toads...so we can just say frogs.) of all time. More recently, however, more fossils from this giant frog have been uncovered, including limbs that were paired with skull fragments that are similar in size to the largest skull fragments already known. As it turns out, Beelzebufo wasn't quite as huge as originally thought, being closer to nine or ten inches long instead of sixteen. It just had a gigantic head for its body. Nine or ten inches is still really big for a frog, though. Diagram of Beelzebufo's skeleton from Evans' 2014 paper. Dark blue is previously known material. Light blue is newer material that led them to believe this frog was smaller than sixteen inches. Grey is guesswork, using modern frog relatives as reference. Another cool thing about Beelzebufo, was that it had a rough texture on the surface of its skull. This suggests there was some kind of tough covering there in life, possibly as defense against predators or maybe even for protection during combat within the species. Large species of frogs today get extremely violent towards each other, especially during mating time, so assuming Beelzebufo could have engaged in similar activity during the Cretaceous isn't out of the question. Close up diagram from Evans 2014 paper showing the tough skull surface and the teeth of Beelzebufo. The environment Beelzebufo would have called home appears to have been seasonally dry, which was quenched by annual wet seasons. Amphibians normally cannot survive in dry habitats. We can observe many amphibians today get around this environmental hurdle by hibernating part of the year, then waking up to breed during the rainy season. It is possible that Beelzebufo could have done something similar. In addition to dryness, this frog would have needed to watch out for meat-eating dinosaurs, like Masiakasaurus, or even the large Majungasaurus, that might have viewed the large frog as prey. That is all for this week! As always comment below! Evans, S., Groenke, J., Jones, M., Turner, A., Krause, D. 2014. 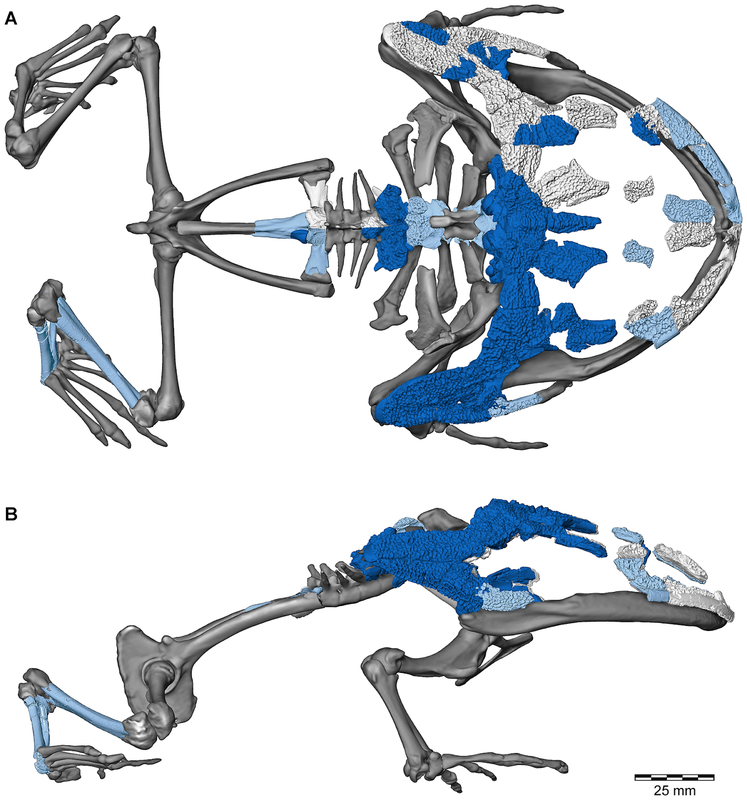 New material of Beelzebufo, a hyperossified frog (Amphibia: Anura) from the Late Cretaceous of Madagascar. PLoS One. 9, 1: e87236. Lappin, A. Kristopher; Wilcox, S.C.; Moriarty, D. J.; Stoeppler, Stephanie A. R.; Evans, Susan E.,; Jones, Marc E. H. (2017). 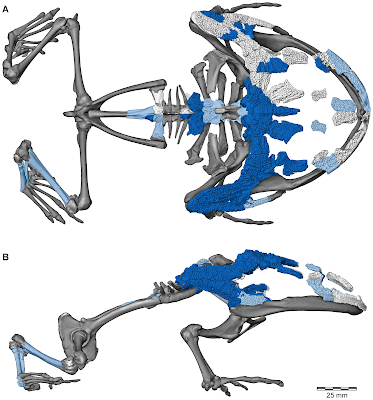 "Bite force in the horned frog (Ceratophrys cranwelli) with implications for extinct giant frogs". Scientific Reports. Earth Day is important. It's the yearly reminder to everyone to treat everyday like Earth Day. (Seriously, we can't afford to be good to our planet only one day per year.) That being said, I'd like to share with you my experiences with some wild neighbors I have met over the years and give you some pointers on how best to enjoy them and respect them, yourself. I'm talking about amphibians. Amphibians are awesome. They're too often lumped with reptiles, both groups together being referred to as "herps", a term that I find dreadful since it takes away the individuality of both, vastly different, and equally fascinating clades of animals. They're not even that closely related. If anything we should be lumping birds with reptiles if we're going off genetics. Why can't we just say "reptiles and amphibians"? Is it that hard? Growing up and living in the North Eastern United States, I have had the privilege of encountering many amphibians since childhood. 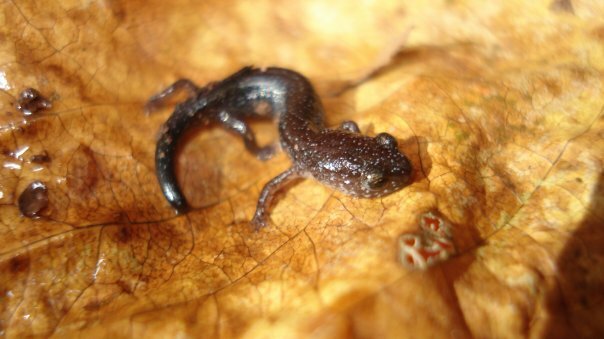 For reasons I cannot explain, I always found myself drawn to salamanders and newts, known as caudates, the most. (I have shared some experiences with some pets that fall into this category before.) 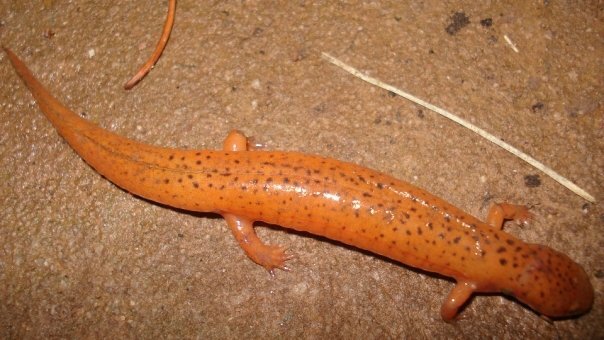 My first wild Salamander encounter happened when I was eleven years old, while riding my bike through a trail near my house. I decided to move a small log out of the trail and to my pleasant surprise, found a Redback Salamander sleeping underneath! Redback Salamander(Plethodon cinereus) I photographed near my family's house in New Jersey. Redback Salamanders are by far the most common caudates in this, and many areas throughout Eastern North America. They are tiny, barely a few inches long, with slender bodies and tiny limbs. 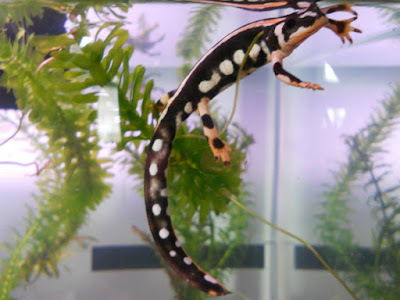 What is remarkable about is that they don't have lungs, belonging to a family called plethodontidae, appropriately nicnkamed, the "lungless salamanders". So how do they breathe? Redback Salamanders, like all amphibians, have absorbent skin that is permeable by both liquids and gases. This means that they can breathe and drink through their skin. 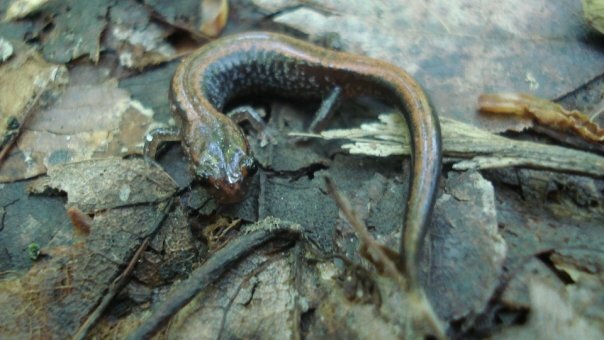 This adaptation, combined with their tiny size, enables Redback Salamanders to absorb enough oxygen through their skin through diffusion, instead of breathing via air passageways and lungs, like many other tetrapods (vertebrates that are not fish) do. "Leadback" morph Redback Salamander I photographed near Rutgers University in New Jersey while on a field trip. My now wife (then crush who was in the class with me) had expressed that she wanted to see a salamander. Upon finding this little guy I immediately ran through the crown, interrupting the professors lecture, to show her. When I went to college at Rutgers University in New Jersey, I spent a lot of time enjoying their botanical garden and walking trail. Part of this trail passed over a shallow brook with lots of smooth, flat rocks. During Fall, I would gently lift up some of these rocks and would often find another awesome salamander, the Two-Lined Salamander! Two-Lined Salamander (Eurycea bislineata) I photographed near Rutgers University in New Jersey. Two-Lined Salamanders get their name because they have two dark lines running down their backs. The rest of the body is a pretty golden-brown color. These little guys are in the same family as Redback Salamanders, also lungless, but prefer to spend their time in shallow water, hiding under and between rocks, rather than on land, under logs. You can't find salamanders like this in just any stream, however. The water must be cold, clear, and clean. Finding them in a body of water is a good indicator that the ecosystem surrounding is likely a healthy one, devoid of pollution. Animals like this, that tell us with their presence or lack of presence if a habitat is healthy or not, are called indicator species. Probably the highlight of my salamander encounters so far occurred when I was visiting family friends in Pennsylvania on their farm They told me they often find salamanders in their old spring house, which made sense since salamanders typically like cold, wet, dark places. When I peeked inside, sure enough, to my delight, I encountered my very first (and only to date) wild Red Salamander! 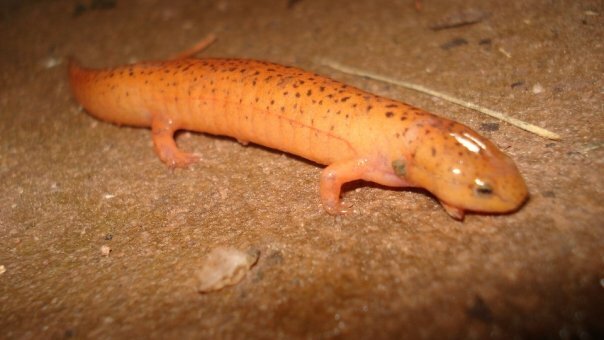 Red Salamanders are also members of the plethodontid family, but are larger than Redbacks and Two-Lined, growing up to six or seven inches long. The one I encountered was still very young, likely recently metamorphed from the tadpole-like larval stage. This species gets its name because of the color of its skin, although some individuals, like the one I met, are more orange, than red. This brightly-colored skin is a warning to most predators that it is distasteful to eat. Red Salamanders spend most of their time in cold bodies of fresh water during the spring and Summer, hang out mostly in muddy burrows near the water in Fall, and will hibernate in burrows during the Winter. Pickerel Frog (Lithobates palustris) I photographed in the Pine Barrens in Southern New Jersey. Pickerel Frogs can be distinguished from their close relatives, Leopard Frogs, by looking at their double row of dark patches down the middle of the back, and their more brownish color. 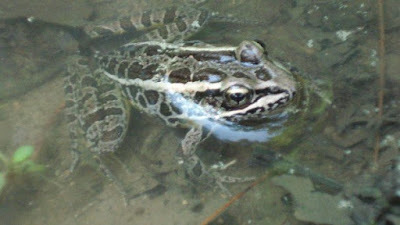 In turn, amphibians, themselves are important food for larger animals. Raccoons, foxes, snakes, all sorts of birds, and large fish, and even some invertebrates, like giant water beetles and dragonflies in their nymph forms, eat amphibians regularly. Without amphibians, these animals may have much harder times staying fed. Sadly, amphibians happen to be some of the most sensitive animals in any given habitat. Their permeable, absorbent skin, which normally is an advantage to them for respiratory and hydration purposes, can also be their downfall when their homes are polluted. If a water source has been tainted with pesticides or other human-made chemicals, amphibians absorb it the most intensely and therefore are usually the first organisms to die off. As stated before, because of this, amphibians serve as indicator species for environments they live in, telling biologists, ecologists, or anyone else who wants to learn about the state of that area, how polluted it may or may not be simply be being present or not. American Toad (Anaxyrus americanus) I met on my street one night. The little guy was hunting insects under a street lamp. So what can you do to help our amphibian friends? Glad you asked! Here is a list of things that I know of that can help. 1) Don't buy produce from sources that use pesticides. Pesticides end up in water habitats where amphibians live via rain runoff. IMPORTANT: Just because a product says "organic" on it does not mean it was pesticide free. Also, a product that doesn't say "organic" very well may be from a safe source. Do your research if you can to learn as much as you can about where food available to you comes from to best figure this out. 2) Use safe fertilizer in your gardens. Some fertilizers are made of harmful chemicals to amphibians that can end up in their homes via rain runoff. AGAIN: research what these chemicals are before you pass judgement. The whole "if you cannot pronounce the name = dangerous" is not always true. Do research on the ingredients in different fertilizers to find out more. 3) Where possible, leave large logs, flat pieces of bark where they are instead of cleaning them up. These things can be homes to amphibians, as well as a lot of other small animals. You can even put out man-made structures, like flat planks of wood to create potential homes for these critters. Just make sure its in places where it is allowed and not where someone might trip over or hurt themselves. (should be a no-brainer, but these days you can't be too careful) If you are looking to meet a wild amphibian, and are suspecting one might be under a log or large plant, carefully put the object back the way it was after lifting it, hen place the salamander or other creature you met directly next to the log so they can crawl back under themselves. If you put the log down over them you might accidentally squish them. That being said, keep handling to a minimum, if any at all, since their absorbent skin soaks up whatever touches them. 5) Pick a captive-bred pet instead of a wild-caught one. And always do all the research and homework on a particular species first. (Never impulse buy) Once you have confirmed that you can appropriately care for an amphibian (or any species for that matter) for the duration of its lifespan, seek out a captive bred animal instead of one that was wild caught. Sadly, many amphibians in the pet trade are taken from the wild. A pet store employee SHOULD tell you truthfully where an animal for sale came from. Reptile expos which typically occur every other month in many states also have lots of experienced breeders, selling their captive bred animals. Always ask, though, since many animals at reptile expos are wild-caught as well. Captive-bred animals are not taking numbers away from wild populations, are more likely to be disease-free, parasite-free, and are already thriving in captivity. Wild caught animals, other than being taken from their natural habitats, weakening that ecosystem, are often stressed from transportation, and may not accept food or ever adjust to living in a tank. It's an all around bad situation. If you find a wild amphibian, yourself, enjoy looking at it, take a picture (no flash), then leave it be! 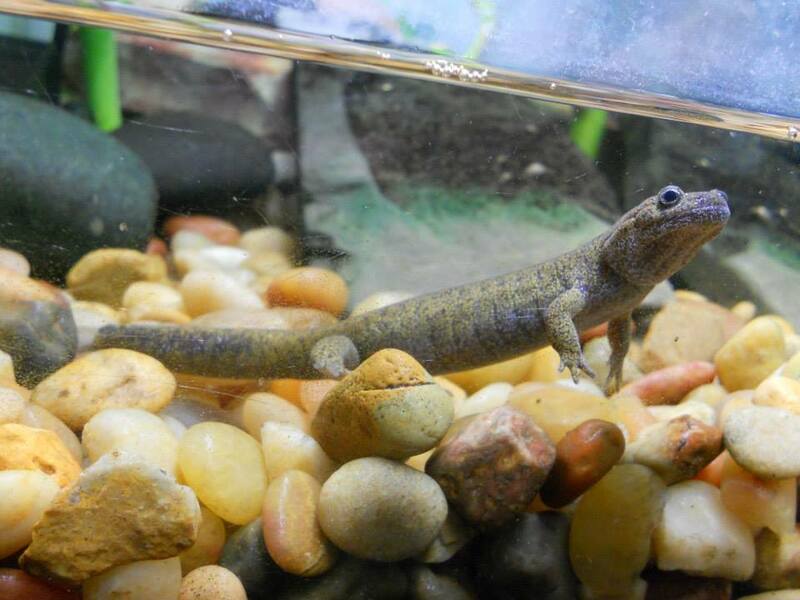 6) Support AZA accredited zoos and aquariums that have amphibians. Zoos and aquariums that are AZA (Association o f Zoos and Aquariums) by definition, contribute large portions of their funds towards wildlife conservation and research. This means that when you pay to visit a zoo, a chunk of that money helps pay for their efforts to save and learn more about endangered species in the wild, as you see and learn about their captive bred counterparts up close. All these places proudly share the research and conservation they are currently involved in wherever possible. Reach out to volunteers and staff there to learn more. Having been a zookeeper, myself for many years, I can say we are always happy to talk to people about the work we do to help wild animals! 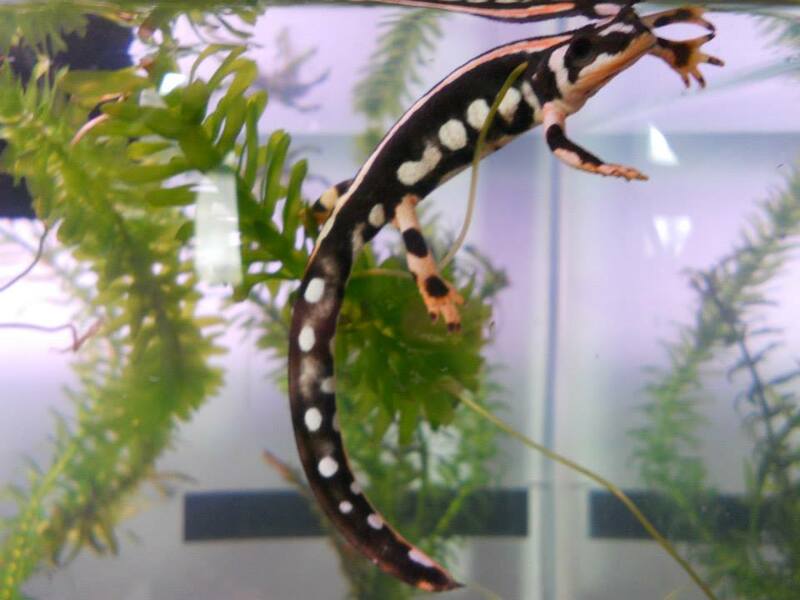 Japanese Dunn's Salamander (Hynobius dunni) I bought for a pet that was captive bred. 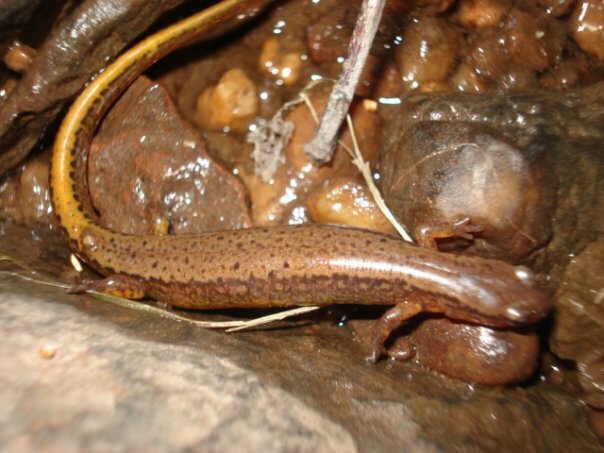 This genus is related to the Giant Salamanders found in China and Japan. Iranian Kaiser Newt (Neurergus kaiseri) I bought for a pet that was captive bred. Arguably one of the most strikingly-colored amphinians out there. Hope you enjoyed me sharing my thoughts and love of all things amphibian with you. Remember, treat EVERYDAY like Earth Day. We need to protect the things we love! This week we will be checking out an extremely famous little dinosaur that has produced arguably one of the most important fossils in history. Let's check out Archaeopteryx! Archaeopyeryx was a small, meat-eating dinosaur that lived in what is now Germany during the late Jurassic Period, about 150 million years ago. The largest specimens measure a little under two feet long from nose to tail. The genus name translates to "Ancient Wing". The most widely used species name, lithographica, in reference to a lithograph since all the Archaeopteryx fossils are preserved in flat slabs of rock. 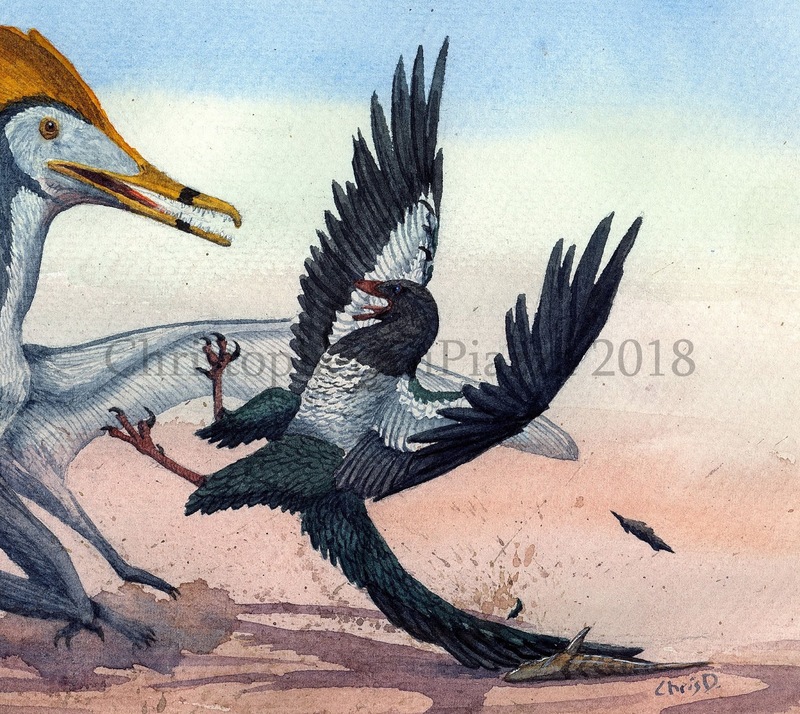 Life reconstruction of Archaeopterx defending a fishy meal from a Pterodactylus. Watercolor by Christopher DiPiazza. Archaeopteryx was the first fossil discovered that showed visible evidence of feathers. In fact, the first ever unearthed specimen of this dinosaur was simply just one preserved feather! It wasn't until a year later that an actual skeleton with feathers was found. These beautifully preserved fossils showed that Archaeopteryx had long wing feathers growing out of its arms, thick feathers on its legs down to the ankles, and a row of long feathers arranged on each side of its tail, which was long, like that of a non-avian dinosaur's. Eventually a total of twelve specimens of this little dinosaur would be unearthed and had paleontologists and biologists alike talking. Archaeopteryx, like birds today, had a fused clavicle (wishbone) and the first toe on each foot appears as if it could have possibly flexed in the opposite direction of its other toes, in a grasping action. Many birds today use this same adaptation to perch. That being said, Archaeopteryx had many features that are closer to non-avian dinosaurs than to birds. It had teeth in its jaws, three long fingers tipped with hooked claws on each hand (although some modern birds do have claws on their wings, but not as long as Archaeopteryx's) and it had a long, bony tail. (birds have short, highly reduced tails.) Another interesting feature is that by looking closely at the bones of all the Archaeopteryx specimens on the fossil record, paleontologists determined that Archaeopteryx would have grown a bit more slowly than many birds today, which usually hit maturity within several weeks. Archaeopteryx would have taken almost an entire year to reach the size it was when it died. Because of this combination of features, Archaeopteryx was and still is considered a very important fossil that plays a part in our understanding of evolution. It was discovered shortly after Charles Darwin's Origin of Species was published, and further strengthened the idea of long term descent with modification by posing as an almost perfect "transitional fossil" between birds and other reptiles. Most complete of the Archaeopteryx specimens on the fossil record, now on display in Berlin, Germany. Note the long, bony tail and the imprints of long feathers on the tail, legs, and wings. So was Archaeopteryx truly a bird? 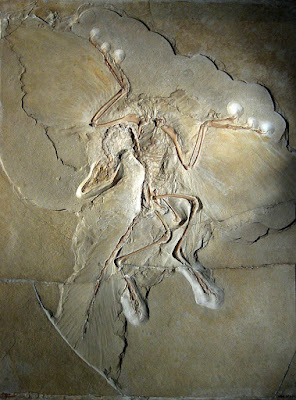 Since its discovery it was long considered so, often posing as "the first bird" or the "ancestor of all living birds". Since it's discovery there have been at least a few other dinosaurs that might take the title as "oldest bird" known to science, however. There was also some suspicion among some paleontologists that Archaeopteryx may have been more closely related to dromaeosaur dinosaurs, like Velociraptor, than to birds. Most recent studies, however, place Archaeopteryx somewhere in between. It likely wasn't a true direct ancestor of the birds we see today, but rather was probably more basal than what we would consider the earliest birds. A sort of "stem-bird" or "proto-bird" if you will. 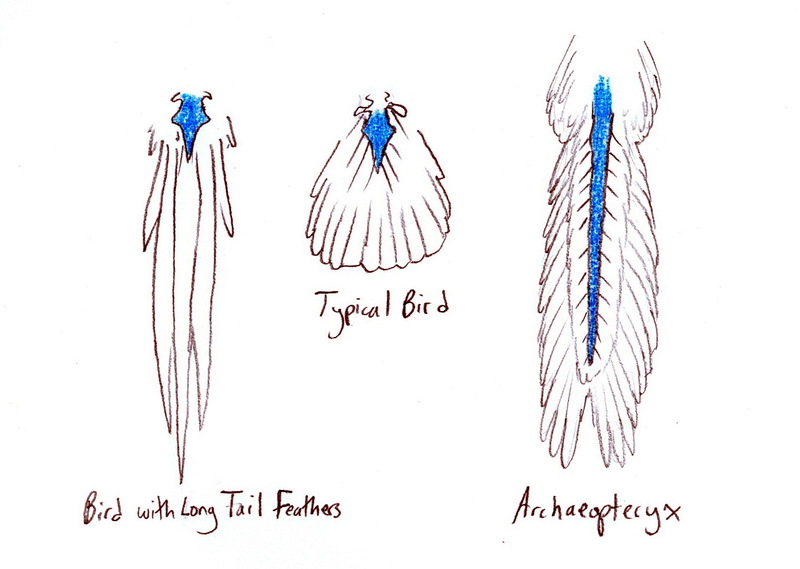 Fast little sketch I did comparing the tails of modern birds to Archaeopteryx. Internal vertebra are in blue. Note how the "tails" of modern birds are really just feathers growing out of a stump. Archaeopteryx, on the other hand, had a true tail supported by its skeleton with feathers growing from either side of it. The arrangement always reminded me of a fern. Archaeopteryx has been the victim of some prejudice with regards of its life reconstructions over the years. Because it was so birdlike in its appearance, it is often depicted as such. Countless artists have recreated Archaeopteryx perching in trees or flying in the air, like a songbird. It is also very common to see reconstructions of this little dinosaur with very brightly colored feathers to really drive home the plumage aspect, despite the fact that for every bright yellow or blue bird alive today, there are plenty of brown and black ones. But how accurate are these depictions? First let's look at the habitat Archaeopteryx would have lived in when alive. The part of Germany its fossils were found in would have been mostly underwater during the late Jurassic, save for a series of close islands. These islands would have been pretty dry, inhabited by mostly low growing plants that could survive dry, sandy soil and lots of sun. There doesn't appear to have been any large animals living here at the time. Archaeopteryx's neighbors were all relatively small, including the pterosaurs, Pterodactylus, Aerodactylus, and Rhamphorhyncus, as well as the slightly larger dinosaur, Compsognathus. In the interior of these islands were fresh and brackish lagoons. These lagoons were where all the fossilized Archaeopteryx, and other animal specimens from this place that have been discovered, ended up shortly after they died. There they remained, mostly undisturbed, being covered by layers of mud, to be fossilized over time. Because of what we know about this environment, Archaeopteryx wouldn't have had many tall trees to roost in, and likely would have been more comfortable running around on the ground, like most theropod dinosaurs of the time. So we know Archaeopteryx was probably comfortable running around on the ground...but it still had those big wings. Could it fly? This is also the subject of much debate. 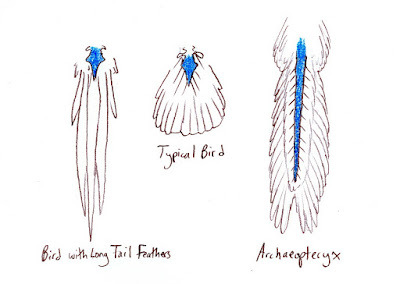 First thing to note is that Archaeopteryx' wing feathers were what we call asymmetrical. This means that the barbs on the front side of the feather vein are more narrow than those on the back side. This is a characteristic seen in modern birds that can fly, to reduce drag while in the air. The tail feathers of Archaeopteryx were also very broad, which would have provided extra lift and maneuverability if it was in the air. Archaeopteryx' brain was large compared to the rest of its body. The parts of the brain associated with sight and coordination were strongly developed, which are both qualities seen in modern birds that enable them to fly. However, Archaeopteryx's arms weren't capable of being raised past its back. So if it were to flap its wings, it couldn't perform the strong upstroke that flying birds do today. It also lacked a keel bone, the extended part of a bird's breastbone that is the attachment site for all the breast muscles that allows most birds to perform powered flight. (Fried Archeopteryx would have been lacking in the white meat department.) That being said this doesn't mean Archaeopteryx couldn't have had enough muscle in its arms and chest to get the job done. As of now, most paleontologists would guess that Archaeopteryx, given its combination of traits, was probably capable of limited flight at best. It was by no means an areal master, like many of the birds you see today, but maybe could fly for short distances if it had to. I would imagine its flight ability similar to that of a pheasant or chicken for a possible living comparison. Great at running, but also capable of short bursts of flight if need be. Archaeopteryx skeletal mount on display at the Academy of Natural Sciences in Philadelphia, PA. Note the lack of prominent keel bone, that would be present in most bird skeletons. Skeletal reconstruction sculpted by Larry Martin and mounted by Bruce Mohn. As for the colors, believe it or not we can confirm what color Archaeopteryx was!...well...actually we can confirm what color one of its feathers was. You see, most of the Archaeopteryx specimens preserved only imprints of the feathers, but not the feathers, themselves. That is except for one isolated feather specimen that appears to have been a covert, that would have grown from the top of the wing. By using electron microscopes and x-rays, paleontologists were able to detect melanosomes that survived the fossilization process. Melanosomes are organelles in the cells of feathers that determine what color the feathers are. The visible color of the feather depends on the shape of the melanosomes. So by looking at the shapes of the melanosomes seen in the Archaeopteryx feather, and then comparing them to the melanosomes in feathers of modern birds that we can visibly see the colors of, it was determined that this Archaeopteryx feather was...black! Specifically matte black, not shiny or iridescent black. (which we have found in other prehistoric dinosaur feathers!) So there you have it...at least one feather on the wing of Archaeopteryx was black. The colors on the rest of the body are still a mystery, however. 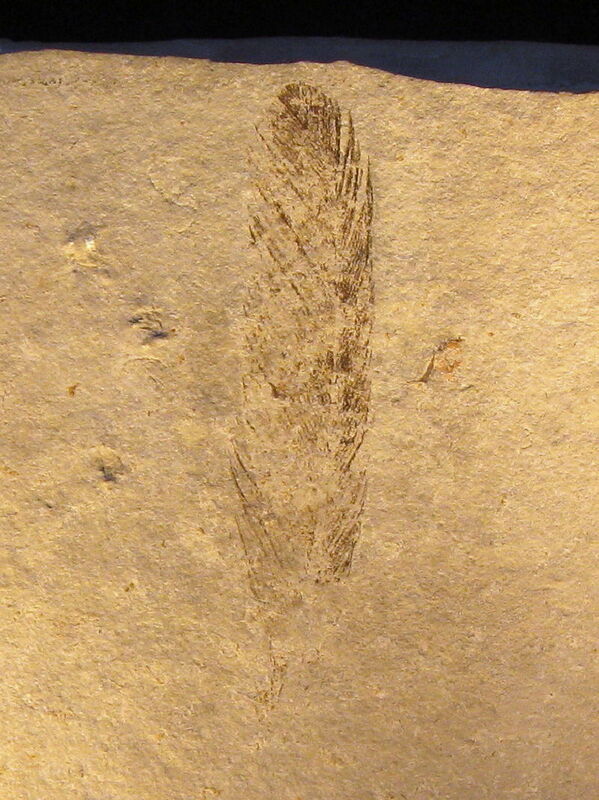 Isolated wing feather associated with Archaeopteryx that provided data on what coloration it probably was in life. So when alive, Archaeopteryx was at least partially black in coloration and running around on the sandy beaches and shallow scrubby forests of its island habitat. When it wanted to, it could fly short distances up into a short tree or across a small lake or pond to escape predators or to chase down prey. It likely would have been hunting small animals, like insects, lizards, and possibly small fish. At the same time it would have needed to look out for predators, like the slightly larger dinosaur, Compsognathus, or competitors, like the pterosaurs that frequented the islands it lived on. That is all for this week! As always feel free to leave a comment below! Buisonjé, P. H. de (1985). "Climatological conditions during deposition of the Solnhofen limestones". In Hecht, M. K.; Ostrom, J. H.; Viohl, G.; and Wellnhofer, P. The beginnings of Birds: Proceedings of the International Archaeopteryx Conference, Eichstatt, 1984. Eichstätt: Freunde des Jura-Museums Eichstätt. pp. 45–65. Carney, R; Vinther, Jakob; Shawkey, Matthew D.; d'Alba, Liliana; Ackermann, Jörg (2012). "New evidence on the colour and nature of the isolated Archaeopteryx feather". Nature Communications. 3: 637. Erickson, Gregory M.; Rauhut, Oliver W. M.; Zhou, Zhonghe; Turner, Alan H.; Inouye, Brian D.; Hu, Dongyu; Norell, Mark A. (2009). Desalle, Robert, ed. Huxley, T. H. (1868). "On the animals which are most nearly intermediate between birds and reptiles". Geol. Mag. 5: 357–65. Huxley, T. H. (1868). "Remarks upon Archaeopteryx lithographica". Proc. R. Soc. Lond. 16: 243–48. Huxley, T. H. (1870) Further evidence of the affinity between the dinosaurian reptiles and birds.. Quart J Geol Soc 26, 32–50; Sci Mem 3, 487–509. Norberg, R. A. (1995). "Feather asymmetry in Archaeopteryx". Nature. 374 (6519): 211. Olson, S. L., & Feduccia, A. (1979). "Flight capability and the pectoral girdle of Archaeopteryx". Nature. 278 (5701): 247. Ostrom, J. H. (1976). "Archaeopteryx and the origin of birds". Biol. J. Linn. Soc. 8 (2): 91–182. Ostrom, J. H. (1985). "Introduction to Archaeopteryx". In Hecht, M. K. O.; Ostrom, J. H.; Viohl, G.; Wellnhofer, P. The Beginnings of Birds: Proceedings of the International Archaeopteryx Conference. Eichstätt: Freunde des Jura-Museums Eichstätt. pp. 9–20. This week we will be checking out a pterosaur that gave us tremendous insight on how pterosaurs reproduced! Enter Hamipterus tianshanensis! Hamipterus was a medium-sized pterosaur that lived in what is now China, during the early Cretaceous period, about 120 million years ago. Judging by its pointed teeth it was likely a meat-eater in life. The largest individuals of this species have wingspans of about eleven feet. The genus name translates to "Hami Wing" in reference to the Hami region in China where it was found, and the fact that it's was pterosaur...which have wings. Female (left) and male (right) Hamipterus. It is likely these pterosaurs met in large groups on sandy banks to nest. Hamipterus is known from over forty individuals, that all died at the same time millions of years ago. This was sad for them, but awesome for paleontologists, who got a great sample size of individuals to study. In this large group were two kinds of adults with differently shaped crests. Like it's relative, Pteranodon, it it likely that these differing crests represent males and females, suggesting sexual dimorphism in yet another pterosaur. The females likely were the individuals with shallow ridge-like crest that ran from the top of the snout to the top of the cranium, over the eyes. The males had similar crests, but the front part on the snout was flared out more, rounding out towards the tip of the snout. In addition, the individuals with the larger crests (probably the males) were larger, with eleven-foot wingspans, while the shorter-crested females typically appear to have only had roughly five-foot wingspans. The teeth of Hamipterus were pointed, and interlocked when the jaws were closed. It is most likely this pterosaur was eating meat, possibly specializing in grabbing slippery fish and other aquatic prey when alive. Amazingly enough, eggs were also found buried among the bones of the Hamipterus! This suggests that all these individuals may have died while in a nesting colony. Large groups of animals nesting in the same area is a behavior seen by many kinds of modern birds, so the fact that pterosaurs may have done the same is exciting. 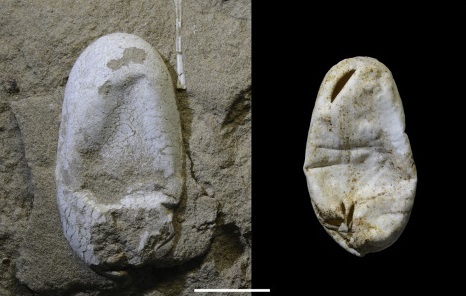 However, the eggs, themselves, of Hamipterus weren't very similar to those of birds, which have hard, brittle, outer shells. Upon close examination, it was discovered that the Hamipterus eggs had very thin outer shells but relatively thick membranes under the shells, meaning they would have been leathery and pliable in life. This is much more similar to the eggs of many kinds of snakes and lizards. Like many squamates (snakes and lizards), Hamipterus may have buried its eggs in the fine sediment until they (would have) hatched. The embryos, themselves, found in some of these eggs show fully developed legs, but underdeveloped arms. 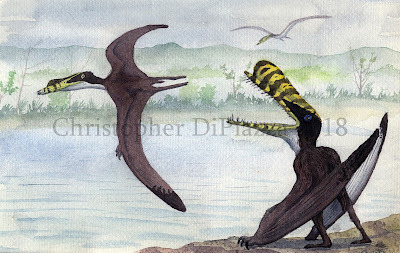 This lead some to believe that the baby pterosaurs were unable to fly as soon as they hatched, and therefore needed to be taken care of by one or both of their parents until they could better fend for themselves. However, keep in mind that these were embryos that had underdeveloped arms, so it is very possible that they weren't done growing before hatching and by the time they did hatch, they very well may have had more developed wings, capable of flight right out of the egg. We still don't know for sure! Xiaolin Wang; Alexander W.A. Kellner; Shunxing Jiang; Qiang Wang; Yingxia Ma; Yahefujiang Paidoula; Xin Cheng; Taissa Rodrigues; Xi Meng; Jialiang Zhang; Ning Li; Zhonghe Zhou (2014). 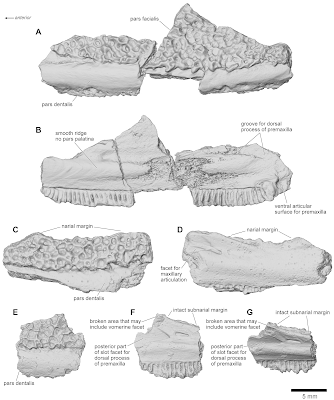 "Sexually dimorphic tridimensionally preserved pterosaurs and their eggs from China". Current Biology. 24 (12): 1323–1330. Xiaolin Wang, Alexander W. A. Kellner, Shunxing Jiang, Xin Cheng, Qiang Wang, Yingxia Ma, Yahefujiang Paidoula, Taissa Rodrigues, He Chen, Juliana M. Sayão, Ning Li, Jialiang Zhang, Renan A. M. Bantim, Xi Meng, Xinjun Zhang, Rui Qiu & Zhonghe Zhou (2017). Egg accumulation with 3D embryos provides insight into the life history of a pterosaur. Science 358(6367): 1197-1201.